Watching your daughter walk down the aisle with her soon-to-be husband is an indescribable moment. You may wonder (as many moms have) how your heart can possibly be prepared. Change can be difficult, especially when it involves our children. Jesus’ invitation -- “Come to Me” -- is always open, and in the face of change His presence is the place to begin. If you’re able, before life gets busy with all things wedding, carve out some time to sit with Him. Consider taking your Bible and journal to a beautiful outdoor spot or favorite coffee shop. Ask yourself some questions: How are you feeling right now? Is there any fear about this new step for your daughter? Do you have a sense of both sadness and joy? Lay your thoughts and feelings before the Lord. Remember that He holds it all and cares about every detail. When the big day comes, turn your heart toward Him often. Share the joy, the gratitude, and even the tears; it’ll keep you centered and make your memories of the day that much sweeter. Wedding planning usually comes with a few challenging moments. Some “what ifs” may creep in. There may be tension between loved ones -- differences of opinion or confusion about who’s doing what and when and how. The big day comes and some detail isn’t exactly right. Don’t allow the enemy to steal the joy of this time. Sure, the circumstances may not be absolutely perfect, but you can always experience God’s peace in the midst of them. If you’re involved in preparations, ask your daughter to sit down with you and share her expectations. Having clear boundaries helps everyone breathe easier. If you’re able, share a time of prayer and lift up any concerns you have. It may be a much-needed connection between the two of you. There is one truth we can stand on when everything feels like it’s shifting around us: “Jesus Christ is the same yesterday and today and forever.” As you navigate the waters of this transition, let Christ be your solid ground. As you hold your daughter in your arms in those fleeting moments, remember there is Someone holding you, too. He’s the unchanging One – always there, working in the details, comforting your heart, laughing and crying with you. This One who led you through her growing-up years is not going anywhere. Let that soak in as you reflect on this life-changing event. It’s a new season, but He’s the same wonderful Savior. Here is a little prayer to help during this sweet, amazing, somewhat scary, yet beautiful moment in your (and your daughter’s) life. Father, I surrender this bittersweet season to you. I know you have plans for my daughter, to give her a future and a hope. May I trust You to be with her every step. Lord Jesus, you showed us with your life that there is a season for everything. May I embrace this transition, giving myself permission to feel whatever comes, knowing that you are my calm center. Holy Spirit, I believe you are with us in every detail, and I trust you to be present, making this beautiful experience a sacred one for all of us. At DaySpring, we have little reminders to help keep you focused on God’s hand during these times. Check out our jewelry, mugs, tumblers and décor pieces all featuring our favorite, comforting Bible verses. Find just the right sentiment for your daughter’s big day in our wedding cards and gifts. Remember Who holds it all and cares about every detail. Send the happy couple your heartfelt congratulations with a Wedding or Engagement eCard from DaySpring. 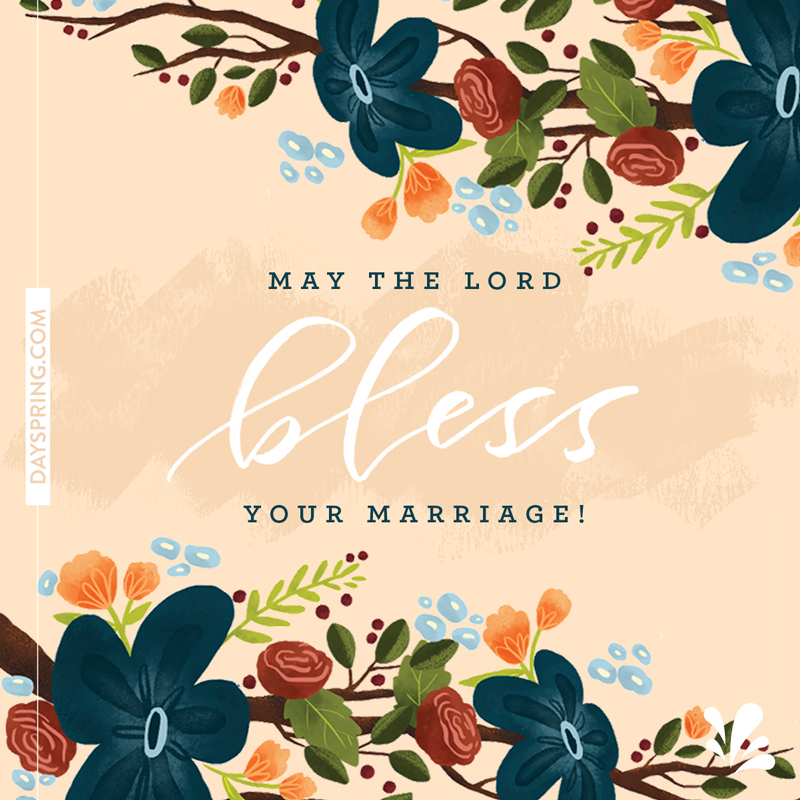 Whether their special day is finally her e or they have just announced their engagement, the effortless gesture of sending a Christian wedding eCard will mean the world to them. These thoughtful reminders of God's love and your blessings will guide them on their journey ahead.